It takes an entire community to save a life! Just 1 pint saves 3 lives. LifeSouth is the primary provider for Children's Healthcare of Atlanta. 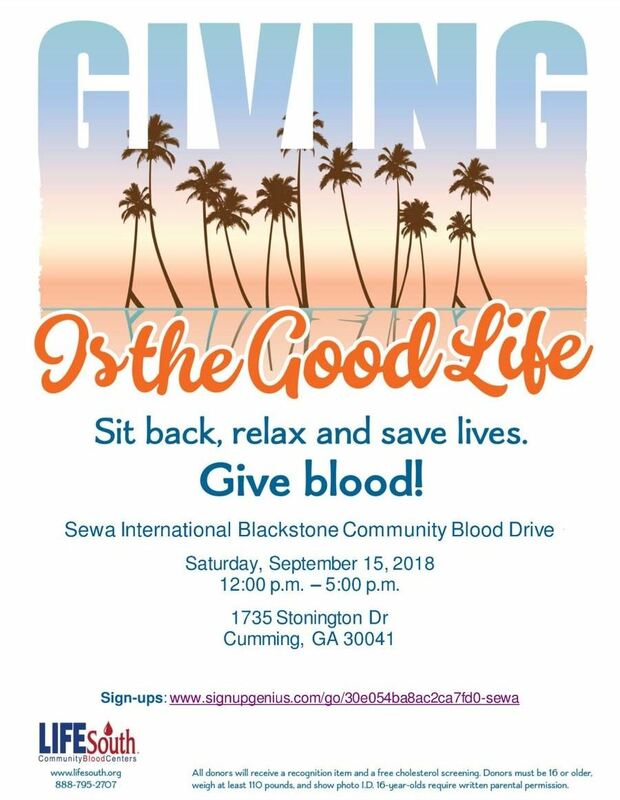 Join Sewa International Blackstone Community Blood Drive with LifeSouth Community Blood Centers Saturday, September 15, 2018 from 12:00 p.m. to 5:00 p.m. Come out and save lives on the Bloodmobile. Blood collected will stay local and supply many hospitals in the metro Atlanta area. Sign up today! Please eat iron rich foods such as red meats, spinach, and pumpkin seeds 2 days prior and hydrate with water before and after the donation. Also, bring government issued I.D. to register.